Pork Chops Recipe: Best Low Carb + Keto Dinner + So Easy To Make!!! 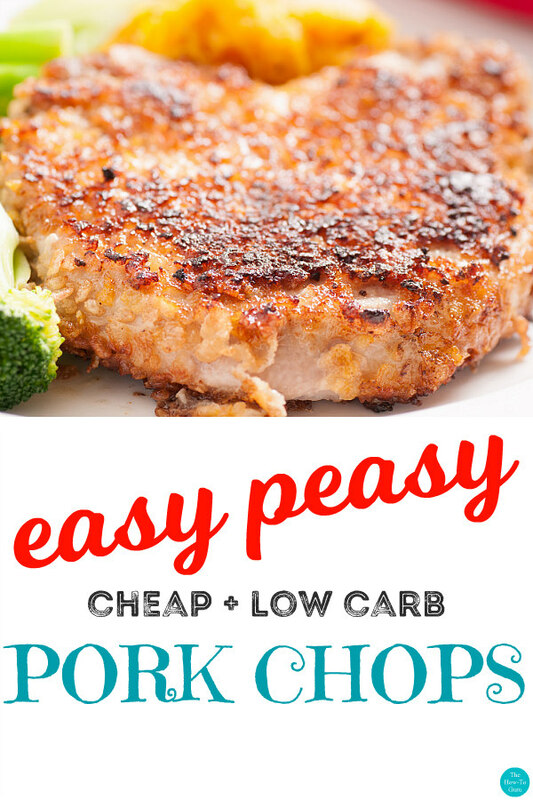 One of my favorite quick meals is this easy low carb baked pork chops recipe sure to knock the socks off of you and the family! How can a pork chops recipe be low carb, have incredible flavor and juiciness, only three ingredients, AND be in the healthy pork chops recipes category?! 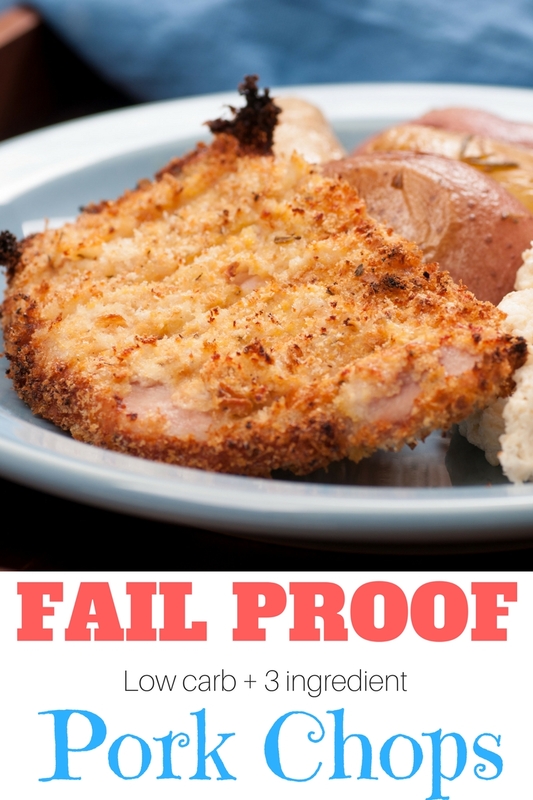 Not your typical pork chop recipe, my low carb coating and quick cooking hacks will result in a flavor you won’t believe. Yes, please! You’ll please even the pickiest of eaters and keep the wallet happy as well. WHY THIS LOW CARB BAKED PORK CHOPS RECIPE? After many failed attempts of trying to make perfect pork chops that weren’t dry and overcooked, I was determined not to give up. After all, pork is such a cheap meat, so I continued to experiment. 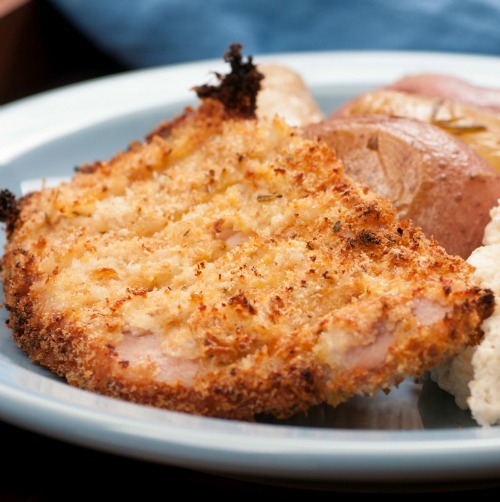 I finally learned how to make the yummy southern version of breaded pork chops but soon was ready for a lighter, low carb pork chop recipe for the family to enjoy. It’s a good thing I’m stubborn because I finally figured it out and can’t wait to share it with you! So, be on the lookout for even more low carb baked pork chops recipes on the near horizon as well as a honey garlic pork chops recipe too since we can’t get enough of this inexpensive meat around here! Believe me when I say that by the time we sit down to eat a meal with this recipe as the star of the show, everyone is pretty stuffed because they’ve been hovering around the stove, “taste testing” the pork chops as soon they come out of the oven. You can quickly pull this recipe off by baking it in an oven safe casserole dish or a cast iron skillet. How do you keep pork chops from drying out? If you follow the directions below and follow the liquid measurements and cook time, they should not dry out. When drying out happens, it’s because this leaner piece of meat is cooked too long. How can you tell if pork chops are done? If you are unsure, stick a meat thermometer in the center of the chop to make sure the temperature is at least 145 degrees and up to 165 degrees. How do you tenderize pork chops? For this recipe, tenderizing the pork chops is not a needed step! Why are my pork chops always tough? Because pork chops are such a lean cut of meat from the piglet, it tends to cook very quickly if you aren’t careful. If you following the timing of the recipe below, you should not have tough and dry meat. That’s why I’m so excited about this meal because it’s so juicy! After preheating the oven, you will dip pork chops into melted butter. Next, you’ll dip chops in melted butter. Mash chops into Parmesan cheese/spices mixture. Place in cookware and then into the preheated oven. Crank up the heat to add a little crispiness to the edges the last five minutes. I don’t do soggy! Again, refer to the printable recipe card below for exact instructions and times. I’m cheating a little when I say that there are only 3 ingredients to add to the pork chops. There’s melted butter, grated Parmesan cheese, and spices. I’m counting spices as one ingredient because this is where you can add a little variety to the flavors. In this original recipe, I used garlic powder, pepper, and a little salt. Feel free to experiment with your favorite spices like adding a little cayenne to give it a little kick now and then! Pork Chops Recipe: Easy + Cheap + Low Carb + 3 Ingredients! Melt butter and keep warm in large bowl. Combine Parmesan and spices in a large bowl. Dip pork chops into butter mixture and then into bowl containing the Parmesan & spice mixture and coat thoroughly. Bake at 375 degrees for 30 minutes, depending on the thickness of the chops. Remove dish carefully and pour off excess juices (you can leave a little). Cook on 400 degrees for 5 minutes til golden brown. This recipe can use an oven safe casserole dish or cast iron skillet for the oven. If you don’t already own a large, 12-inch cast iron skillet, I can’t stress enough what an invaluable cooking hack this tool is to me in the kitchen. It’s the perfect size to fit individual meats or full meals that are cooked on the stove top OR put it the oven. This one even comes with a silicone hot handle holder to protect your hands from this hot pan that has been in oven temps up to 450° F! Mine didn’t come with an awesome handle like this! The Perfect Cast Iron Skillet! HOW TO MAKE EASY OATMEAL CHOCOLATE CHIP COOKIES FOR BREAKFAST!!! Granted, the images here can’t express how delicious and juicy these pork chops are. They aren’t the most photogenic either so you’ll have to trust me! I kept hearing about a Parmesan-crusted pork chop recipe all around the web but this traditional method had too many carbs and complicated steps for me. I must have easy. Score one for Mom! I hope this baked pork chops tutorial was helpful and allows you to do something else besides standing in the kitchen for far too long. Let me know what you think! Have you tried this low carb pork chops recipe yet? 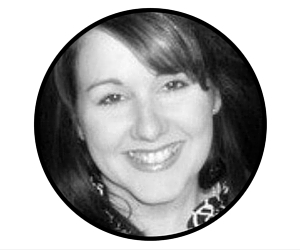 Previous Post Intentional: How To Pick Your WifeLife ‘Theme’ For The Best Year Ever! Next Post How To Shop Your Pantry In 5 Easy Steps When You’re Broke & Busy! My daughter might like this! I love three ingrediants plus ready in the oven! Oh my goodness, thank you for sharing this! My husband and I have been searching for new ways to cook pork chops. We have both been going low carb for a few months and it’s easy to lose steam when you keep eating the same things over and over again. This looks wonderful! I hear you, Jordan! So glad it’s excited you for something new. Let me know what you think! There is nothing like a great pork chop and my family loves them. What a simple recipe to use and enjoy. That looks delicious. I wish my husband would eat pork chops. I cook them a lot when I go to see my Papaw. He likes them. I will be trying these for sure. I love anything with parmesan cheese. Plus, they are quick which is needed on school nights. I also love a good pork chop! Thanks for the recipe. I can’t wait to try it! Thank you so much for this. We are so bored with our current meal plans! Yay, Jasmine! Thanks so much. I’m yum!! I’m so trying this!! This looks so yummy! My mom always made these growing up. Delicious! This looks good and I know my family would love it! I typically make my pork chops the same way -just grilled with herbs, however, I like to switch things up so I’m definitely going to try this. Yum! I follow the SCD protocol & LOVE easy dinner ideas like this! My husband and I love pork chops, but don’t typically eat them often. I will definitely need to use this recipe and surprise him next week!